Backlit crane landing at the north crane pool, Bosque del Apache NWR. Nikon D800E, AF-S NIKKOR 500mm f/4G ED VR and AF-S Teleconverter TC-14E II, 1/1250th s, f/5.6 at ISO 6400! Manual mode, +.7 EV. Jobu Jr3 Gimbal head. Image copyright 2013 Robert OToole Photography. Shooting in backlit conditions is a favorite of mine when the light is just right as long as you are careful to avoid too much side light which will ruin the pleasing soft light. The D800E continues to impress me to the point that I find myself making excuses to keep my D4. This place never fails to amaze and surprise. This was my tenth year photographing and leading tours at the refuge and it was my favorite year yet. Take a look at some of my favorite images below to get an idea of what this year was like. 3 Crane sunset, north crane pool, Bosque del Apache NWR. Nikon D800E, AF-S NIKKOR 14-24G ED VR @ 19mm, 1/125th s, f/8 at ISO 900. Manual mode, Auto-ISO Jobu Jr3 Gimbal head. Image copyright 2013 Robert OToole Photography. Bosque is the place to go for unforgettable skies filled with unbelievable colors. Every year is different at Bosque and while the conditions this year were not the best ever, the new refugee staff and management are very open to improving the photographic opportunities so I am sure that the shooting there will improve a lot over the next few years. This year the intermittent road is open again, this time in a clockwise direction. The road will also be open this weekend so be sure to check it out if you are in town as there were lots of opportunities on the road this year. Sandhill crane coming in to roost at the north crane pool, Bosque del Apache NWR. Nikon D800E, AF-S NIKKOR 500mm f/4G ED VR and AF-S Teleconverter TC-14E II, 1/30th s, f/5.6 at ISO 800. Manual mode, +.3 EV. Jobu Jr3 Gimbal head. Image copyright 2013 Robert OToole Photography. I cannot deny I love to make speed blur images and this is my favorite from this year. The out of focus blurred cranes filling the bottom of the frame are an interesting element. We were lucky to experience a couple of days of snow this year which is always a lot of fun. We also had a few cloudy days with south winds that are the magic ingredients for great opportunities for birds in flight. Even though not all of the traditional go to spots were good this year there were plenty of opportunities for blast offs, close ups, flight photography and plenty of action overall including some chances for coyotes taking birds and cranes taking rodents. We were also lucky to have a few days of excellent colorful skies that Bosque is known for. South wind landing, farm fields, Bosque del Apache NWR. Nikon D4, AF-S NIKKOR 500mm f/4G ED VR and AF-S Teleconverter TC-14E II, 1/30th s, f/5.6 at ISO 800. Manual mode, +.3 EV. Jobu Jr3 Gimbal head. Image copyright 2013 Robert OToole Photography. With south wind and soft light the farm loop can be a gold mind for cranes in flight. Crane with new mud boots, Bosque del Apache NWR. Nikon D4, AF-S NIKKOR 500mm f/4G ED VR and AF-S Teleconverter TC-14E II, 1/1250th s, f/5.6 at ISO 640. Manual mode, +.3 EV. Jobu Jr3 Gimbal head. Image copyright 2013 Robert OToole Photography. This crane was definitely heavier on take off with what looks like 5 pounds of mud stuck to its feet. Thanks to generous support by Sigma USA I was able to donate time to this year at the Festival of the Cranes to give two talks and lead four workshops for the Friends of the Bosque during the festival. This was an opportunity for me to give something back for all the hard work and time the Friends of the Bosque have done over the years with education and volunteering and more. Thank you to everyone that attended a show or workshop this year . I feel lucky to have been able to meet so many nice new people and share amazing experiences on the reserve with my friends and tour participants. Sandhill crane painting with light at 1/20th of a sec, Bosque del Apache NWR. Nikon D800E, AF-S NIKKOR 500mm f/4G ED VR and AF-S Teleconverter TC-14E II, 1/20th s, f/5.6 at ISO 450. Manual mode, +.3 EV. Jobu Jr3 Gimbal head. Image copyright 2013 Robert OToole Photography. This crane made the image possible by painting with its wings while my shutter was open, I just pointed my camera and squeezed the trigger, the crane did all the work. 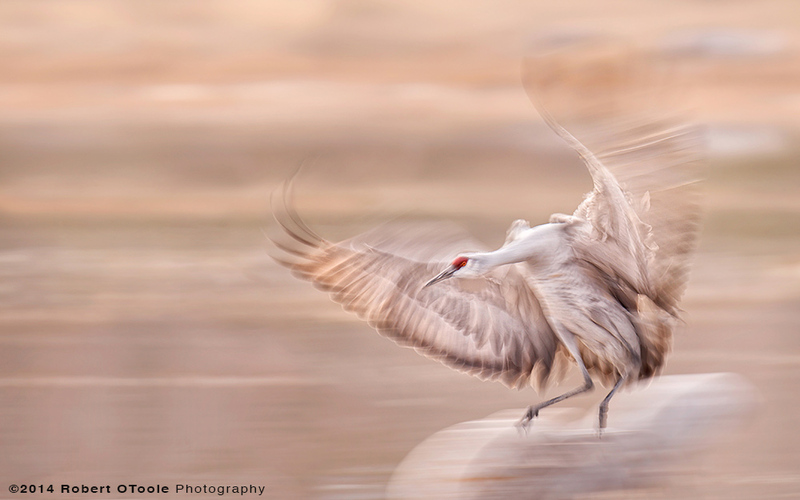 South crane pool take off in early morning light, Bosque del Apache NWR. Nikon D800E, AF-S NIKKOR 500mm f/4G ED VR and AF-S Teleconverter TC-14E II, 1/1250th s, f/5.6 at ISO 720, Auto -ISO. Jobu Jr3 Gimbal head. Image copyright 2013 Robert OToole Photography. All alone at the crane pool, just my tour group and a few cranes. When most of the photographers and cranes leave the crane pool the real magic and fun can start. Late afternoon arrival at the north crane pool, Bosque del Apache NWR. Nikon D800E, AF-S NIKKOR 500mm f/4G ED VR and AF-S Teleconverter TC-14E II, 1/500th s, f/5.6 at ISO 2800, Auto-ISO. Manual mode. Jobu Jr3 Gimbal head. Image copyright 2013 Robert OToole Photography. When the light is too low to continue to make stop action images I switch to doing speed blurs. Then when the light level is even too low for blurs I prefer to shoot crane silhouettes against the last areas of color left in the sky before darkness. I will be leading multiple tours next year at Bosque and will post more information here as soon as it is available. If you would like to join me in 2014 at Bosque please email me. I will be posting more images from Bosque this year made with Sigma lenses on the Sigma website soon. Be sure to share a comment or question below.